T-minus 3 days until Mother's Day - eep! Don't worry, I've gotcha covered. I decided to bring this easy peasy diy out of the artsocial archives this week because a) I'll be using it (mom, look away!) and b) it's so beautiful and easy. Let's make them every week, k? 01 Roll a sheet of kraft paper into a cone shape. Make sure the shape fits the flowers you’ve chosen (I opted for a tall, narrow shape for my flowers). Secure with clear or washi tape. Repeat for each bouquet. 02 Wrap kraft paper cone with twine. Add gift tag to one end of the twine. Tie ends together to make a bow. Repeat for each bouquet. P.S. for my gift tags, I simply cut small rectangles of the kraft paper, punched a hole at the top, and stamped “xoxo” on each (which you can also write with pen, white pastel, or paint). 03 Prep flowers by cutting them down to the proper size. Wet a sheet of paper towel, wrap it around the end of the flower, and place it into a ziplock bag. Repeat with each flower. This will keep the flowers hydrated until your mama can get them home. 04 Place the flower into the kraft paper cone and you’re good to go, homegirl. Pair it with the perfect card to score some major points. Oh hello, friends. Things are heatin' up with Eat Drink Create right around the corner! The artsocial headquarters is a wonderful mess of balloons, goodie bag treasures, and name tag assembly lines. This event is going to be off the heezy! And I only bust out that phrase when I reeeeally mean it. So while I don't have June's Project Brown Bag recap for ya quite yet, the PBB train must roll on. Louise of Laid Off Mom is hosting the final round of PBB - psst and there's a twist!! So head on over to Laid Off Mom for the deets and to sign up to be a contributor! It's only the best collaborative art project around. No big deal. Image: Whimsical Balloons by Laura Ruth. That's right, friends. Lexy and I are doing it again! We've been workin' hard to prepare for the next Eat Drink Create and, I'm tellin' you, this one is going to be off. the. hook. We're planning one sweet little party in the park. We've teamed up with Fancy Tiger Crafts and October Ink for one super awesome diy project. The Humble Pie Store will be providing - yep - PIE! And Minted is giving us a hand with some suh-weet picnic party decor. Don't miss it, ya hear! Check out the hashtag #eatdrinkcreate to follow along with our party prep adventures and get pumped. I can't wait to party it up with you Denver gals! Invitation + logo design by Sarah Fritzler. Planning for the Madewell event last week was hella fun. From the beginning I was dead-set on having party favors for everyone. I went through a few different ideas before settling on mini succulent favors, which were frickin' adorbs + perfect for the Madewell aesthetic (photos coming soon)! I'd love to get one of these beauties at a party, wouldn't you? 01 Roll a sheet of kraft paper into a cone shape. Make sure the shape fits the flowers you've chosen (I opted for a tall, narrow shape for my flowers). Secure with clear or washi tape. Repeat for each favor. 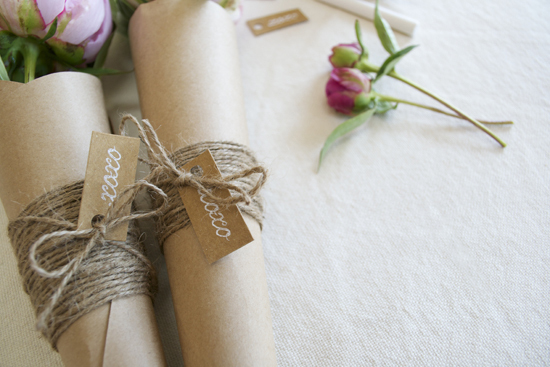 02 Wrap kraft paper cone with twine. Add gift tag to one end of the twine. Tie ends together to make a bow. Repeat for each favor. P.S. for my gift tags, I simply cut small rectangles of the kraft paper, punched a hole at the top, and stamped "xoxo" on each (which you can also write with pen, white pastel, or paint). 03 Prep flowers by cutting them down to the proper size. Wet a sheet of paper towel, wrap it around the end of the flower, and place it into a ziplock bag. Repeat with each flower. This will keep the flowers hydrated until your guests get them home. 04 Place the flower into the kraft paper cone and you're good to go, homegirl. Your flower favors are ready for the party. My Be Creative project rolls on, friends! How is it already June?? I had a blast last month tapping into my inner child by doing these fun diy projects, here and here. But now it's time to switch gears... June will be dedicated to spending time in nature. Much like meditation, spending time in nature can help us quiet our minds and create the mental conditions necessary for inspiration to come forth and new ideas to pop into our heads. Later this month I'll be taking a little trip into NATURE... that's right. This nature destination deserves all caps. Kevin and I will be going to Yosemite for a whole week!! Wahoo! It will be the perfect time to put this method to the test. But in the meantime, to remind myself to spend more time in nature I've created this desktop background... and guess what? You can download it, too! Wahoo! Are you inspired by nature? Do you have a favorite place to walk or hike that always helps you clear your head? I'd love to hear about it! This post is part of the Be Creative project. Join me as I try 12 different methods for boosting creativity over the course of 12 months. Every Tuesday I’ll share my progress along with creative projects… Catch up on past Be Creative posts here! This month I've been experimenting with playing more + embracing my inner child to boost my creativity. Now, I don't necessarily mean I'm blowing bubbles and flying kites - although I did blow bubbles this weekend at a birthday party and it. was. awesome. Embracing play has been less about the actual activities and more about my state of mind. One where I'm open to learning, experimenting, and trying new things. No pressure or focus on the final product or outcome. Just playing, trying, and experiencing the world with an open heart and sense of wonder. Boy, it's not easy to maintain a lighthearted sense of play when things get cray. Deadlines, schedules, and plans undoubtedly get in the way... but when I can get into that relaxed + playful state of mind, creativity does flow. I haven't had any creativity blocks this month and some suuuper exciting things are in the works... check back tomorrow for a big announcement! I've come back to these photos by Anna Palma a few times this week (major art crush). They capture that lighthearted - but srsly awesome - sense of play I'm striving towards this month. They remind me how important it is to just HAVE FUN with the creative process... it sure makes everything more enjoyable. So go have fun today! That's an order. Photos by Anna Palma; Art Direction Chole Lloyd; Illustration by Willow Mayor; Hair/Mua by Willow Mayor.